This easy-to-use reference tool combines the best features of a concordance, dictionary, topical Bible, and handbook - in one volume! Even with its convenient size, the Zondervan All-in-One Bible Reference Guide offers a wide range of topics, people, places, and events from the Bible, arranged alphabetically so you can easily find the information you need. ^^To get the most out of studying the Bible usually requires a concordance, a dictionary, a topical Bible, and a handbook. Zondervan All-in-One Bible Reference Guidecombines the best features of all four in one convenient location. ^ ^This easy-to-use resource covers a wide range of topics, people, places, events, and themes from Scripture. Entries are arranged alphabetically, making it easy for us to find the information needed to expand our understanding of God's Word.^ ^Zondervan All-in-One Bible Reference Guide is ideal for pastors, Bible study leaders, and everyone who wants to learn more from God's Word. ^ ^Based on the NIV the most read, most trusted translation of the Bible this reference guide will prove to be indispensable, no matter what translation is used. 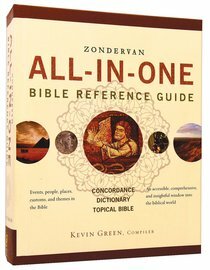 About "Zondervan All-In-One Bible Reference Guide"
Kevin Green is the founding Pastor of Living Stone Church in Barryton, Michigan. He has been involved in church planting and discipleship ministry for over fifteen years. Kevin earned a Th.M. in Pastoral Leadership from Dallas Theological Seminary. He is married to Elissa, and they have two children, Margaret and Zachary.